In the 1880s the DMP classified crime in two distinct classes. Political crimes were ‘special’, whereas theft, robbery and even murder, no matter how terrible, were ‘ordinary’. Dublin, June 1887: the mutilated bodies of a man and a child are discovered in Phoenix Park and Detective Sergeant Joe Swallow steps up to investigate. Cynical and tired, Swallow is a man living on past successes in need of a win. In the background, the city is sweltering in a long summer heatwave, a potential gangland war is simmering as the chief lieutenants of a dying crime boss size each other up and the castle administration want the celebration of Queen Victoria’s Golden jubilee to pass off without complication. Underneath it all, the growing threat of anti-British radicals is never far away. With the Land War at its height, the priority is to contain ‘special’ crime. 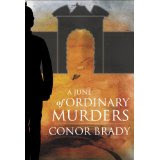 But these murders appear to be ‘ordinary’ and thus of lesser priority. When the evidence suggests high-level involvement, and as the body count increases, Swallow must navigate the waters of foolish superiors, political directives and frayed tempers to investigate the crime, find the true murderer and deliver justice. The Dublin Metropolitan Police: A Short History and Genealogical Guide.